It’s always a pleasure to have one of Sarah Ruhl’s plays in town. Ruhl (b. 1974) is a playwright with a delightful, comic-serious outlook. Her plays have an off-center, soft-edged sensibility as she muses about the complexity of living, and the illusions needed to make it through bewilderment. In the DC area we have been fortunate to often have her works produced as premieres thanks to Woolly Mammoth and Arena. Her Dead Man’s Cell Phone, produced at Woolly, received a Helen Hayes Award for Best New Play. Recently, No Rules Theater produced one of Ruhl’s earlier works from 2003 Late: A Cowboy Song. 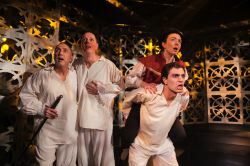 Now WSC Avant Bard is bringing audiences another early Ruhl work. It is her adventure, fantasy Orlando, an adaptation of Virginia Woolf’s long literary love-letter “Orlando, A Biography” which was published in 1928. In Orlando Ruhl distilled Woolf’s literature about time travel across centuries and crossing over gender boundaries to experience sensuality. So what is Orlando about? Well, it tells the story of a young man named Orlando (played by Sara Barker). We first meet him during the time of Queen Elizabeth I (a flamboyant Mario Baldessari). We first gaze at him under an oak tree furiously trying his hand at poetry; he fails at it. His youthful gamin looks lead him to ever so briefly become the elderly queen’s lover. Soon after Elizabeth’s death, Orlando is smitten with Sasha (a flirty, breezy Amanda Forstrom), a young, mysterious Russian noble woman stuck in England because of a deep freeze. They have an passionate affair which opens Orlando’s eyes to truer love. It all too quickly ends. Then come other suitors including an annoying, persistent archduchess (a glitzy, gaudy Jay Hardee). Orlando decides to escape to Constantinople. All of this takes place with Orlando as a male. After waking from a long sleep, though not Rip Van Winkle in length, Orlando wakens to find himself transformed. He is no longer a male, but a woman. As a female, she is the same person and seems to have the same engaging personality. But physically she is clearly a woman as we readily witness through a gauzy, translucent white sheet. Orlando seems to have the same personality. Orlando learns the extent that the change to become a woman makes on life and living. The least of it being that were once he pursued women, now she is pursued by what become a true love (a solid, engaging Andrew Ferlo) and by the same archduchess who reveals herself to be a man (Jay Hardee again). All of these adventures happen over a period of several centuries; with many changing mores and life styles. The play ends in the early 20th century. Orlando has aged to be 36. 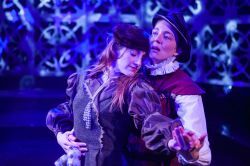 The Ruhl adaptation does not resolve questions the character Orlando poses, such as “Which the greater ecstasy, the man’s or the woman’s?” What the show does is to provide a clever, smart glance into a fluid life of growing-up and finding love. A top-notch design team has turned a diminutive space in an otherwise non-descript Shirlington office building off of Arlington’s Four Mile Run into a lovely patch of visual delights. 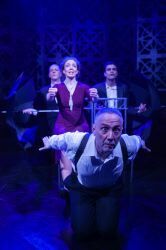 The moment the audience walks through the doors of a small hallway into the stage area, they are carried far away from the humdrum of real life. There is a handsome diamond-shaped set design by Steven Royal composed of many filigree wooden panels and an oak tree composed of paper leaves handing from the ceiling. The panels give a peek-a-boo, feel to the production. The audience sits surrounding the set, looking down into the action rather than observing up. The audience become emerged into the play, not just passive observers. The lighting design by Joseph R. Walls is a gorgeous color wheel of feelings and moods. The lighting gives a sense of time and seasons peaking through the wooden panels or as dropped from above. There are shades of autumn orange and amber, the lush bright greens of spring, the cold halogen bright white of a snowy winter, and warm turquoise and strawberry reds of summer. Debra Kim Sivigny’s costumes allow us to travel well through time and gender with the cast. 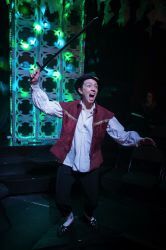 The gamin Sara Barker completely immerses herself into the gender-bending role of Orlando. Her voice work even has the slightest change in pitch as she moves between male and female characterizations. She is a believable androgynous young man with an externally-focused, restless energy. Her body and arms are active, her face less so. Later with her “new” womanhood her acting style changes along with her newly seen female figure. It is not just her new clothes that make a difference in her outlook. She shows an inner being. Her eyes can be on fire, her smile wider, her cheek bones even seem to show more. She moves her eyes and eye brows without saying a word, but large emotions are telegraphed. Filling out the production is a Chorus of actors playing over a dozen different characters. Ruhl’s stage direction suggested that the Chorus “may be cast without regard to gender and may be double-cast. May be played by as few as three actors and as many as eight, but the author suggests a chorus of three gifted men to play all the roles. Director Jackson has taken the three men approach. At times and over the course of the show, an over-the-top frolicking attitude can become grating adding a bit too much unnecessary sugar. Orlando never pushes limits or boundaries very hard. It is not in-your-face in any manner. It is not meant as a polemic. It is an agreeable scamper through sparkly fields, rather than a deep plunge over a cliff or a mystery told before a campfire. It is a dessert plate full of petit-fours to devour with someone you love. Often it is something like taking a single petit-four from a small plate and placing into the mouth of one you love. Yummy and just what you need for that particular moment in time. Note: There are “afterchats” with cast members after Sunday matinees. Disclaimer: WSC Avant Bard provided two complimentary media tickets to ShowBizRadio for this review. This article can be linked to as: http://showbizradio.com/go/9971.